Welcome to the first instalment of our news digest. We will be bringing to you news from the week, as well as any interesting articles and videos that we have found in that time. 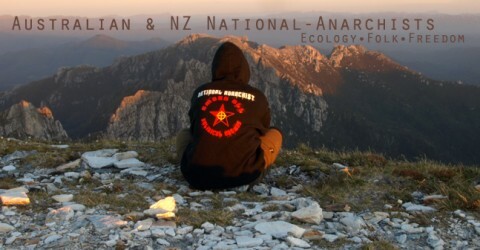 Nationalanarchistausnz.com (this website) – We have added a video of a recent talk by Welf Herfurth, as well as the complete National-Anarchist Movement manifesto. BANA – An interview with Lloyd Lacy, Memphis black National-Anarchist. Berrocscir’s Banner – Cut Consumerism! High alert over theft of top secret ASIO and police files – Government security measures such as ASIO and the police do not make us more secure. Communities should be responsible for their security, not the government. USA FDA won’t allow food to be labeled free of genetic modification! – Shows just how much say the multinational pro-GM corporations have, they are now dictating that the companies which don’t use their dodgy products are not allowed to inform people of this. Civil war in Germany? Stuttgart 21 protests rock country – Police brutality against children and the elderly peacefully protesting against the destruction of historic buildings and gardens in Stuttgart. Don’t eat GM soy if you’re thinking of having children – In a new study on rats, GM soy was found to be wrecking the ovary and endometrium. Shameless flu shot pushers use strip clubs to entice people into medically useless vaccinations! Is the Out of Africa theory out? – New research on teeth from early humans proves against the politically correct “Out of Africa” theory. New law passed banning comment on South Australian elections unless a real name and postcode is supplied! Who owns the media? The 6 monolithic corporations that control almost everything we watch, hear and read. We need to provide real cultural alternatives to this addiction to destructive capitalist “entertainment”. Left Wing Brainwashing and Radicalisation of Britain part 1 and part 2 – While we don’t agree with the pro-capitalist sentiment expressed in this mainstream American video from the 80s, we think it is definitely worth watching as it shows Marxist groups making the decisions about what books are banned from schools, and the messed-up reasoning that goes into this. It also shows some very disturbing books that were introduced into schools, and how the council wouldn’t listen to what the parents wanted about this, and used police force to get them away. A principal forced to resign because he didn’t want to destroy scholarship applications, an African woman complains because African food isn’t served every day at her child’s mainstream English school. This is more fuel for the National-Anarchist argument, where we advocate that children are raised with the values of their parents, NOT the system’s corrupt values, or ones of any special interest groups. Children should be able succeed based on their own merit, not discriminated against because of their race. If someone wants their child to only eat African food, then this would be possible within a community of their choosing. If someone wants their children to read certain books and not others, then that should be up to them, and not the state. Homeschooling offers an immediate solution to these problems, and homeschooled children are usually better educated than those in regular schools. Gillard won’t budge on internet filter – Australian prime minister thinks she needs to make our moral judgements for us! We are more than capable of deciding what we do and don’t want to see, we don’t need the nanny state. Muslim “Germanophobia”… in of all places, Germany – Worrying article detailing the abuse that native Germans are suffering in schools because of excessive immigration. Is free thinking a mental illness? “New mental illnesses identified by the DSM-IV include arrogance, narcissism, above-average creativity, cynicism, and antisocial behavior. In the past, these were called “personality traits,” but now they’re diseases. http://www.national-anarchist.net/ – A promising new National-Anarchist movement, with a website which includes some interesting articles. We have posted the manifesto on this website in parts. THE precise meaning of the word ‘revolution’ is often highly contested. It can mean a violent overthrow of the existing order, or perhaps a sudden break with current trends. The fact that revolution contains the root word ‘revolve’, meanwhile, indicates that it also relates to a return of some kind. Think of the way that a compass takes a pencil back to its original starting point, for example. For us, there are several definitions surrounding the word ‘revolution’ and each of them have an important role to play in their own right. Most revolutions that have taken place throughout history have led to a cruel and systematic betrayal of ordinary men and women. Millions have lost their lives and many others cynically used to overthrow a crooked ruling class on behalf of an equally corrupt and jealous bourgeoisie. National-Anarchists are vigorously opposed to the artificial injustices of the enforced class system and believe, not in Marxist ‘equality’ and ‘egalitarianism’, but in a natural meritocracy that adequately reflects the true nature of the individual and his role in society. There have been many positive examples of revolutionary activity, among them the Luddites of 1812, the Swing Riots and Tolpuddle Martyrs of the 1830s, the co-operative movement established by the Rochdale Pioneers, Robert Owen’s communal experiments in both Scotland and America, the French Commune of 1871 and the agricultural co-operatives which were set up by Anarchists during the Spanish Civil War of the mid-1930s. Those on the Left try to claim these revolutionary currents for their own, but they do not have a monopoly when it comes to fighting against capitalism and, as we discussed earlier on, they often bring about capitalism in a slightly modified form. The examples mentioned above are part of a long tradition of struggle and National-Anarchism is the latest in a long line of genuine revolutionary currents that seek to bring about political self-expression, economic freedom and social justice. Although we have already discussed various ways in which National-Anarchists can engage in revolutionary activity within the belly of the beast, so to speak, right here in the West, we also support the strategy of revolution on the periphery. In other words, we believe that revolutionary groups in the Third World are leading the way in the struggle against capitalist greed and exploitation. We therefore offer our critical support to all groups and organisations that fight on the frontline against the so-called New World Order and who seek to retain or reclaim their economic independence or racial and cultural identity. It is important to remember that revolution in the West is an extremely risky affair, at least if people try to arm themselves and take on the Establishment at this stage in the game. Direct armed resistance in the Third World, however, helps to weaken the globalist core because it either prevents or slows down the export of crops, minerals and various other resources to the West. At present, the West is able to buy off the corrupt leaders of Third World governments – many of whom have been plunged into debt through war and excessive borrowing – so that African and Asian resources are sent abroad at the point of a gun. This obviously results in starvation and misery for the indigenous people. But if the West finds it increasingly difficult to extract what it wants from the countries on the periphery, it will begin to wither and die in the way that the old Roman Empire began to collapse as a result of being overstretched in a perpetual quest for foreign territory, manpower and natural resources. Anything which weakens the West, therefore, must be good for those of us living beneath the jackboot of international capitalism and who desire real change. The task we have set ourselves is a great one. The fight for culture, identity and economic self-determination is a cause that gives us a great sense of purpose and destiny. And yet, for those who are called to this fight in the immediate future, we can only offer a long and difficult road which is often characterised by disappointment and pain. Due to the fact that the path of the revolutionary is so difficult, many who join us simply fall by the wayside, unable to live up to the ideals. Such people inevitably cite a multitude of reasons for dropping out; from family problems to the fear of being ‘exposed’ as a National-Anarchist. But behind the excuses lies just one reason: the fact that they are not prepared to make even the smallest of sacrifices within their own lives to help us gain victory. Needless to say, we can well do without such people. In place of people such as this we seek a new type of individual, someone who is prepared to put his or her ideals before anything else. Here is the mark of a true revolutionary; an activist in the unselfish service of race and nation. And rest assured, never has our vision been in greater need of such individuals. In this modern era the concept of sacrifice is anathema to virtually everyone. Modern man laughs at the idea of sacrifice. He proclaims: ‘If I do a job I want paying for it. I never do anything for nothing.’ Such a man has no understanding of higher ideals and knows even less about how to fight for them. It is because of such people and their selfish egocentrism that our civilisation is in such decay. One notable exception to this decline in idealism is that given to us by Hamas fighters waging a war of liberation in Zionist-occupied Palestine and, in particular, the men within their ranks who are prepared to die for their beliefs. Such heroism in the face of overwhelming odds is inspired. It shows us that the concept of personal sacrifice in pursuit of a political goal is not dead. It also shows that where such an ideal is harnessed and used it becomes a deadly force that cannot be beaten. Zionist Jews know all about the consequences of the Palestinian uprising and, make no mistake, they fear it. If we are to win then we must follow such a example, an example born of purity of thought and action. We must endeavour to go down this road because it is the only road that will lead us to victory. Our ideals must inspire in us the same level of dedication and fanaticism, they must give us the same inner strength which breeds invincibility. Only if we can achieve this will we become a force capable of confronting and beating our enemies. In working towards this aim there are two immediate goals that must be achieved by everyone. Firstly, we must not be like other men and women, people who are solely the product of corporate advertisers, media propagandists, the liberal agenda and the materialist ethos. We must set ourselves apart and become true followers of the revolutionary way. Only when we are ideologically free of the System can we attack it with the clarity of vision needed to defeat it. Secondly, our goal must be to fight. Always to fight. If we are fighting, then we are winning. If we put down the sword, then we have already lost. This fight demands loyalty and it demands commitment. If we are not prepared to give our blood, sweat and tears then we will achieve nothing. There will be no advance and no victory. Nothing is more certain. The ideal of sacrifice is not new. We revolutionaries have been pushing both it and the relationship between sacrifice and victory for a number of years. But whilst in the past these words seem to have fallen on deaf ears, they are now being taken seriously by dedicated revolutionaries. It is testimony to the strength of the National-Anarchist revolutionary that after all the betrayals and sell-outs of recent years, there has emerged a new mode of dedicated and dogged fanaticism. It is in this atmosphere, cleansed of compromise, that the possibility exists for moving the revolutionary cause into a new and more threatening position. For the sake of our future communities and their people the opportunity must be seized. Julian Beck, Hitler’s Children: The Story of the Baader-Meinhof Terrorist Gang, Pickwick Books, 1989. Gordon Carr, The Angry Brigade: A History of Britain’s First Urban Guerrilla Group, Gollancz, 1975. Corneliu Z. Codreanu, Legion: The Nest Leader’s Manual, Liberty Bell Publications, 1990. Julius Evola, Men Among the Ruins, Inner Traditions, 1992. Sergei Nechayev, Catechism of the Revolutionist, The Rising Press, 2000. Peter Töpfer, Hans Cany & Troy Southgate, Nationalanarchismus: Manifest und Texte, Eigner Verlag, 2004. NATIONAL-ANARCHISTS do not suppose for one moment that alternative communities which have made a break with the system can remain immune from attack on a permanent basis. Human nature is such that, inevitably, there will always be potential outsiders wishing to cause trouble or steal our resources. Whilst we may be decentralists ourselves, many others are not and therefore our land and property will have to be vigorously defended like any other community. We reject utopianism and believe that we must always look at these things realistically, because our village-communities will have to arm themselves appropriately in order to survive. This does not, however, require the existence of a standing army or police force. According to John E. Pfeiffer, writing in The Emergence of Man (Harper & Row, 1969), “when a group exceeds 500 persons, it requires some form of policing”. The reason being, 500 is the maximum number of people that a single individual can know personally and therefore if people in National-Anarchist areas are comparatively more familiar with their neighbours it will result in a more settled and peaceful community. Unlike the anonymous, atomised, urban societies of today, where most people rarely ever communicate with their neighbours, or try to avoid doing so as much as possible, crime will be reduced as a result of the fact that residing amongst one’s extended family (aunts, uncles, grandfathers and grandmothers etc.) tends to keep the peace through a process known as ‘shaming’. In other words, people are naturally discouraged from committing crimes against their neighbours if they are known to the community at large and therefore likely to face a degree of shame and embarrassment if caught. It won’t make crime totally non-existent, obviously, but it will make such incidents far more isolated. This means that there is absolutely no need whatsoever for police, because National-Anarchist communities will police themselves in the way that villages used to before the establishment of a police force in the Victorian period. And even that came about as a result of overpopulation and a lack of street lighting which led to disorder in large cities and towns. The moment when a policeman puts on his uniform is the very instance when he divides himself from the rest of the community at large and that must never be allowed to happen. The same goes for a standing army, because whilst National-Anarchists will clearly need to defend themselves by networking with like-minded communities, this can be achieved through good regional co-operation rather than by keeping arms in the hands of a centralised body. On the contrary, we propose that National-Anarchist communities form a confederation of loosely-organised militia comprised of individuals who have other roles in society but who are also highly trained in the methods of self-defence and, if necessary, warfare. In Medieval Europe, for example, farmers and artisans would serve in their feudal overlord’s private army for a certain number of days each year. We are not suggesting that people serve a local baron or member of the nobility, obviously, but our system will be fairly similar in that ordinary members of the public – especially young people – will be operating in a dual capacity and thus be able to provide some form of military service on an intermittent or infrequent basis. This will require good communication and training, but with the right determination and commitment it will be possible to provide an effective defensive force in a more decentralised context. Finally, it goes without saying that arms will be held in the hands of the community itself. This system has been operating very successfully in modern-day Switzerland for many years and whilst gun ownership comes with great responsibility gun crime itself is extremely rare. National-Anarchists also believe in providing help and advice on survivalism, martial arts and other forms of self-defence, all important skills which are becoming increasingly vital as contemporary society continues to slide into chaos and the streets become more and more dangerous. Marc ‘Animal’ MacYoung, Ending Violence Quickly: How Bouncers, Bodyguards and Other Security Professionals Handle Ugly Situations, Paladin Press, 1996. Sun Tzu, The Art of War, New Dawn Press, 2007. ONE of the main reasons people choose to become involved in political activity, is due to a growing concern towards the kind of world our children will be forced to inherit in the future. As opponents of private and state capitalism we would all like to see a new generation of young people become instilled with our own healthy values, but for a System which allows its moral and intellectual standards to be fixed by the mass society – so that individuality and non-participation are discouraged – this becomes a rather subversive demand. Are we fighting a losing battle or can we somehow ensure that our message of political, social and economic decentralisation is passed on to the youth of tomorrow? It is our view that the political and economic objectives of the National-Anarchist Movement must be preceded by a spiritual revolution which begins in the hearts and minds of individuals and then spreads by example. If we cannot change ourselves, then we cannot ever expect to encourage others to share our worldview and thus help build alternatives to the present system. Furthermore, if we do not set an example to our children then we will inevitably lose them to the prevailing anti-culture of television game shows, abortion-on-demand, gangsta-rap, drug-addiction and conformist apathy. The only way that we can succeed, therefore, is by rejecting the system itself and making the education of our own youth a priority. Ever since the second half of the nineteenth century and the gradual expansion of the proletariat, parents no longer have the task of educating their children and most are deposited into State-run or grant-maintained schools. But is it right that a mother who is opposed to wage-slavery and economic servitude should be thrust into the workplace whilst her children are indoctrinated by the very system that she and her spouse vigorously oppose? Of course not. Picture the scene as a fifteen year-old child is taught by her parents that hunter-gatherer societies on the periphery are being undermined by the exploitative fatcats at the industrial core. Before long, the same child is being informed by her teacher in the classroom that the Enlightenment and the Industrial Revolution are responsible for the betterment of society as a whole and that she must write an essay on Adam Smith’s Wealth of Nations by next Tuesday. Short of marching up to the school every two or three days, to complain to the headmaster that a certain teacher is contradicting their beliefs, there is very little the child’s parents can do in such a situation. The only alternative is for parents to take their children out of school completely and educate them at home. According to one source, “there are two broad groups of home educators: those with a philosophy and those with a problem.” But whilst many children are constantly exposed to bullying and various other problems, we should be primarily interested in how our children are developing ideologically. With the gradual decline of academic standards in modern society, many parents are exploring the option of home-schooling as a means of securing a sound education for their children. This idea is becoming very popular amongst religious groups, particularly Pagan and Muslim parents who have come to realise that the safest way of ensuring that their children receive an education based around their respective traditional and ethnic values, is to teach them first-hand. We must ensure that those of us with children make full use of this vital option. Home-schooling is certainly not a new concept. After all, before the advent of schools or educational systems it was considered perfectly natural for parents to educate and nurture their own children, with many of them viewing it as a sacred task. Nowadays. many parents are waking up to the fact that whilst people vary and have different needs, the National Curriculum merely demonstrates how a bureaucratic educational system is unable to cater for all tastes. Indeed, all curricula are heavily steeped in propaganda and those parents who believe in independence and creativity are becoming anxious for their children to have an opportunity to explore an alternative set of political or spiritual issues. It is also a fact that the less we depend upon the institutions of the state, the more freedom we can have over our own lives. Once you start exploring the options, you will discover that there are many self-help groups out there who can give you important advice about how to proceed. Few people are aware that home-schoolers do not have to follow the National Curriculum. In fact they do not have to take tests or exams, do not have to have a timetable, do not have to have a qualified tutor to teach them, do not have to work during the usual school hours and do not have to work any particular number of hours a week. Parents themselves can provide their own teaching syllabuses and materials, not least because in most countries the state refuses to give them any financial assistance. Whist this may suggest that home-schooling is a costly business, especially for working class folk, teaching materials are not really that expensive. There are a wide range of preparatory textbooks which can be ordered from libraries. Alternatively, second-hand bookshops can often enable you to pick up a variety of useful encyclopaedias and other basic study aids for very little cost. If several National-Anarchists living in one area wish to organise a teaching environment for their children, books, stationary and other resources can even be shared. The proposed environment can simply be a room in a National-Anarchist household, one which has been set aside for a blackboard, a small collection of educational literature and some painting, drawing and modelling materials. Research has shown that many home-schooled children are two years ahead of those educated in schools and considerably more self-motivated. Parents are able to build up interesting programmes for their children using a wide range of sources, from selective school broadcasts on television to local museums. The choice extends to formal lessons, computer programmes, reading, playing, music, cooking, craftwork, sports and outdoor activities. Some parents may be concerned that home-schooling will result in their children being excluded from universities and colleges when they approach the official school-leaving age, due to the fact that it does not gear them towards tests and examinations. However, universities welcome application from home-schooled students and believe students educated primarily at home possess the passion for knowledge, independence and self-reliance that enables them to excel in intellectually challenging programmes of study. So schools will undoubtedly fade into the background as the whole community becomes a network of learning centres with people themselves taking full control of their family’s education. One argument used by the liberal opponents of home-schooling is that children raised in such an environment will somehow grow up ‘sheltered’ or ‘socially naive’. However, this accusation can easily be refuted by pointing out that home-schooling essentially protects the innocence of childhood from the ravages of the mass society in which we find ourselves. Indeed, why shouldn’t parents seek to defend their offspring from the trappings of liberal-capitalism? Another favourite contention put forward by those who favour mass educational methods relates to the issue of socialisation. But whereas children do need to socialise with other children, this is not the reason why they attend schools, anyway; schools should be there to educate children, not force them to adhere to a specific pattern of behaviour. Parents who home-school their children already ensure that their youngsters come into contact with other people through clubs, societies and associations. Home-schooling enables children to socialise within their own communities, rather than be subjected to the forced tyranny of the adolescent peer group. According to the March 1996 issue of Child Education magazine (p.68): “Several studies of home educated children have found that they have better social skills and are better socially adjusted than children of the same age who are educated at school. Home educated children tend to have more experience of relating to people who are both older and younger than themselves. In addition, they have had the particular benefit of learning through conversation and close personal contact. How often are children in a class of thirty or more listened to individually, talked to personally and praised and encouraged?” High praise indeed from a journal produced by the educational establishment! If National-Anarchist parents are able to introduce their children to like-minded families in the same area it is possible to prevent ‘outsiders’ from having any influence upon their lives whatsoever. Indeed, by herding thirty or forty children of the same age group together in one room, schools inevitably create an artificial environment. This process hardly prepares young people for the harsh realities of life outside. In addition, the school is designed to turn youngsters into a ready-made workforce and far from acquainting them with their historical and cultural traditions, adopts a production-line approach in order to prepare them for the boring servility of the factory floor or the computer terminal. Parents feel that there is plenty of time to get to grips with the grim realities of boring, repetitive jobs. Indeed, they may choose home education because they do not want their children to accept such limitations. They may hope instead to foster resourcefulness and individuality which will prepare them for more adventurous, interesting lives. Finally, many of us are already involved in such initiatives and, in the future, hope to build an alternative home-education network. The growing distrust parents have towards the incompetence of state schooling is a crack in the enemy’s amour that is waiting to be exploited. Conscientious parents instinctively know that something is wrong with the system and are looking for a way out of it. Such people need our example and incentive, and there is no reason why National-Anarchists cannot become one of the leading proponents of home education. We must establish practical learning centres, where tools and equipment will be available for those who wish to borrow them; we must install alternative libraries where children can gain access to alternative books, tapes, films and exhibitions; we must create Community Centres to involve local people in sports activities, music, drama and social events; and we must set up family advice groups, where parents and children can meet up to discuss useful teaching methods and, if necessary, air potential problems or difficulties. In the meantime, if you are a parent who is unprepared to see your child force-fed a daily diet of ‘political correctness’ and ‘positive discrimination’, then you should seriously consider the educational alternatives which are gradually becoming available. We must never lose sight of the fact that our alternative future lies in its youth. WHILST the modern world appears to be in a state of great disarray, the perpetual relevance of nature both as a guide and a source of inspiration continues to invite our utmost respect and admiration. Sadly, however, the vast majority of people have become alienated from their origins, detached from their racial and cultural heritage, and cut off from their roots. In the past, man had an inextricable bond with the soil. Not only was his racial heritage of great importance, but he also knew how essential it was to carve out and defend a territory in which to express his own values and aspirations. Sadly, however, due to the immense destruction that has been wrought on the environment today, not least in the overpopulated countries of Europe and North America, it is impossible to live in harmony with nature without moving away from the cities and out into the countryside. There have been many ‘back-to-the-land’ movements down the centuries, some religious and others politically idealistic or even disastrously utopian. But the National-Anarchist vision of a rural revolution is not utopian, unworkable or unrealistic in the slightest. We realise that any attempt to set up and maintain National-Anarchist communities will be extremely difficult, but we have to start the process now before it’s too late. Life in our modern cities and towns is incredibly fragile and people are wholly dependant on exterior resources. Gas, electricity, food and water all have to be brought in from outside. In the event of a major catastrophe, however, or a situation in which the state decides to withdraw or cut off the supply, it will not be possible to pop down to the local supermarket for a tray of diced pork or expect water to come out of the tap when you turn it on. Modern existence and its throwaway culture is based on convenience, but this makes people extremely weak and in times of crisis they soon find that they have lost the ability to perform the most simple and basic tasks that will help them survive. National-Anarchists wish to end this passive dependence on the state and reintroduce people to the real, organic world. For some people, this will be completely impossible and many are incapable of getting to grips with the environment. But at one time, people in rural villages were utterly self-sufficient and had no need for outsiders or to support a government that obtained its wealth and power by constantly declaring war on Third World countries and stealing their resources. The natural environment contains all the resources we are ever likely to need. The economic collapse that is likely to take place in the West will result in complete panic and disarray. Millions will perish as a result of their reliance on the state. We have to make sure that we are included among those who can withstand such an emergency, but unless we begin to construct our own village-communities now we will simply go down with everyone else. The first step is to move away from the urban areas and begin to downsize. Try to think about the things that will really help you and your family survive, rather than what is perhaps unnecessary or too extravagant. These things are often a question of scale and many of the things you consider to be important at the present time will become obsolete in the future. Survival, on the other hand, is never obsolete, it is absolutely essential. Relocating to the countryside is just the first step in helping to replenish the natural order and live in accordance with the environment. The next step is to become economically self-sufficient and that means finding a source of income that will allow you to remain in the countryside and avoid being sucked into the centre, which is what happened during the Industrial Revolution. In other words, by setting up the kind of economic alternatives discussed in the previous section – bartering, local exchange trading schemes, co-operatives etc. – you will begin to empower both yourselves and the local community. This may sound a little scary to people who have had little or no experience of the countryside, but there are already hundreds of Anarchist and other alternative communities around the world that have become self-sufficient. It all depends how serious you are and whether you can learn to prioritise. Habitation in the contemporary world often involves taking out mortgages from banks or renting expensive property from exploitative landlords, but National-Anarchists believe there are other ways to make homes for ourselves and our families. By pooling their resources, some Anarchists have bought small plots of land and constructed their own alternative dwellings. Houses can be made, not simply from bricks and other expensive building materials, but also from rammed earth, straw bales and recycled materials. Indeed, whilst the interior design of such houses are just as functional and attractive as modern houses, they are made from very cheap materials and this opens up immense opportunities for people operating on far smaller budgets and who wish to be economically independent. Dwellings of this nature can also be built underground, or utilise power from wind, water or the sun. The National-Anarchist Movement is also committed to re-establishing our rural crafts and what used to be known as the ‘cottage industry’. At one time, country crafts and folk traditions flourished throughout the whole of Europe and included weaving, cobbling, stonewall construction, pottery, home-baking, blacksmithing, herbalism, woodcraft, thatching, pickling, book-binding, dressmaking, brewing, tanning and hundreds of other methods which relied on the resources people had to hand. Many of these things continue to exist in rural areas today, but to a certain extent even they have become dependant on outside suppliers and it is debatable whether or not they are completely self-sufficient. Some of these examples may seem rather quaint and old-fashioned, but this is because they have been submerged beneath a barrage of over-production and commercial junk. Economic independence makes you stronger. Other benefits include a busy social life. National-Anarchists are keen to promote an alternative music industry and encourage more leisure time in which people can organise sports events, perform music and make their own entertainment. It seems incredible that some of the most natural things in the world now need to be revitalised due to the modern individual’s dependence on the more voyeuristic pastimes like television, video games and computer networking. Until those of us who are involved in the ecological struggle can learn to appreciate the spiritual reality which binds man to his environment, reactionaries, liberals and leftists alike will continue to delay the replenishment of the natural order. We revolutionaries can only revitalise and reclaim the natural world from the clutches of capitalism once we have discovered that which lies within ourselves. It is vital for us to come to terms with the fact that we sprang from the soil and are destined to return to it at the end of our brief sojourn upon this earth. So without a recognition of our inherent racial qualities and a territory in which to express our tribal identity, some of which may have to be forged elsewhere, we will remain as much a threatened species as the white rhino, the giant panda and the large blue butterfly. As Europe and North America struggles to cope with the catastrophic results of inner-city habitation and suicidal race-mixing, National-Anarchists must never forget that we humans are the natural guardians of the soil and our extinction would be possibly the greatest ecological disaster of all. This is why we must seek to re-establish ourselves in the heart of the rural countryside. Ted Kaczynski, Industrial Society and It’s Future: The Unabomber’s Manifesto, Green Anarchist, 1995. John Seymour, Far From Paradise: The Story of Man’s Impact on the Environment, BBC, 1986. THE last few years have seen the international stockbrokers and high street banks become increasingly materialistic, even going so far as to swallow one another up in a rapacious war of all-against-all. There is no sentiment in business, of course, but money was not always used for person gain and began as a means of exchange. At one time, of course, people would barter – or exchange – various items without using money at all. Since then, however, money has become a commodity in itself and the money-grubbing speculators and middle-men have devoured our communities like financial piranha. By lending money at exorbitant rates of interest, the modern usurers, loan sharks and creditors have tightened their vice-like grip around the throats of our national economies. But whilst the money-lenders can create their own finance with the mere stroke of a pen or just a few taps on the keyboard, their clients have to pay it back in real terms – including interest. Regardless how much real money or gold bullion they have hidden away in the vaults, the banks simply hand over a paper cheque and then expect you to pay them off with hard cash over an agreed period of time. If you lose your job, on the other hand, or find that you are unable to keep up the repayments for any other reason, the bailiffs arrive to seize your possessions or, in many cases, your home. The usurers also manipulate entire governments by shackling them to the national debt. This is incurred by those countries which have borrowed money to go to war or prop up their flagging economies, but it has to be repaid through rising taxation and this leads, inevitably, to a decline in public services and affects the poorest people in society. So what are the economic alternatives? We have long predicted that the internationalist system will collapse under its own weight, but you can help us hasten that process by making sure that you operate outside the present economic infrastructure as much as you possibly can. There has always been a black market, of course, but there are more legal ways of avoiding the banks, the loan companies and the taxmen. One way this can be achieved is through bartering or by setting up local exchange trading services (LETS), which enable people to trade skills and services. This operates by creating a credit scheme that is rather similar to the way money used to function before the system became corrupted. If someone cuts your hair, for example, you may wish to use the barter system and return the favour by mowing their lawn or giving their daughter piano lessons. With the LETs idea, on the other hand, you may receive a haircut and find that you are not currently able to offer anything in return. Perhaps your job is seasonal, for example. This problem can easily be surmounted by appointing a community book-keeper who makes a note of all transactions. If somebody owes somebody else for receiving a service of some kind, the person who provided the service receives either a credit note or form of local currency. But there is no interest involved. In London, for example, there is the ‘Brixton pound’, and thousands more communities around Europe and the world each have their own local versions of the exchange trading system. Alternative currencies drive government bureaucrats and tax-collectors alike wild with fury, because people are operating outside the official economic parameters and thus strengthening the community at the expense of the state. National-Anarchists can also establish alternative businesses. All it takes is for a group of people to grow their own food or make their own goods and set up a co-operative and participate in a trading scheme as a means of exchanging goods or services with other National-Anarchists in the community. Rather than pay with national currency, however, the purchasers should use an alternative currency or provide a service or skill in return. These schemes can become so highly successful that very often money rarely changes hands at all and everybody benefits from the economic freedom that this creates. Remember: we don’t have to involve ourselves in the current economic structure, see what you can do to withdraw from the fraudulent money system and live a more independent and self-sufficient life. AS far as the Left is concerned, National-Anarchism is simply a form of generic fascism or, according to some of the more paranoid theories, a Right-wing conspiracy devoted to the subversion of the Left itself. Needless to say, this interpretation is incorrect and National-Anarchists are vigorously opposed to statism and reaction in all forms. At the same time, the ‘national’ component of the term National-Anarchism centres on the fact that we are racial separatists. Needless to say, whilst we wish to form Anarchist communities that are ethnically organic we also oppose negative and counter-productive attitudes that encourage racial hatred or mindless violence. Race-based politics have nearly always been the domain of Right-wing organisations. But the fact that National-Anarchists are prepared to address this thorny issue should not cause people to wrongly dismiss us as yet another Right-wing organisation committed to promoting ‘white supremacy’, because National-Anarchism itself transcends both Left and Right. We are not supremacist, racist, statist or totalitarian. In addition, the German National-Socialists and Italian Fascists of the twentieth century allied themselves with large banking interests and betrayed the more ‘socialistic’ aspects of their original programmes. We are genuine Anarchists and proud of the fact. Right-wing organisations that recommend either a tightening of current immigration laws or advocate that people of non-European descent be repatriated to their countries of ethnic origin, inevitably try to play the system at its own game and therefore always come off second-best. The reason for this is simple. Not only do they become seduced and then corrupted by the parliamentary establishment and end up having to compromise in order to make electoral progress, they also reinforce the nonsensical realities of the modern nation-state by completely failing to understand the important difference between citizenship and ethnicity. As we mentioned in the Introduction, the 1789 French Revolution transformed a nation of monarchical subjects into citizens of a new republic, but aside from the fact that the jingoistic watchwords of ‘liberty, equality and fraternity’ were never put into practice, it did become possible for individuals to become part of the nation through citizenship alone, rather than it being a result of their French ethnicity. This subtle change has now smoothed the way for modern capitalists to bring in economic migrants from the Third World who, allegedly, are just as ‘French’, ‘English’ or ‘German’ as those of us with a blood-lineage stretching back thousands of years. The ‘nations’ of today, therefore, are completely false. By giving credence to these artificial entities, the Right actually reinforces the liberal-democratic myth. However, due to mass immigration and shifting demographics, the populations of contemporary Western ‘nations’ are changing all the time and therefore the establishment makes a determined effort to constantly redefine the whole concept of nationhood. The multi-racial populations of Europe and North America cannot be regarded as ‘nations’ at all. People of non-European extraction may well be national citizens and hold a valid passport informing them that they have become ‘naturalised’, but, in reality, true nationhood is based on ethnic considerations. Names like ‘England’, ‘France’ and ‘Germany’ were once related to specific tribes and they were hardly Moorish, Bedouin or Zulu, so the fact that modern nation-states no longer reflect the ethnic identity of those original Indo-European tribes – or at least not entirely – makes the whole thing a total farce. Is northern Paris, with its large African population, still French? Are the Turks who have settled in Deutschland still German? Of course not. Race defines who we are, it provides us with an identity and exists for a damn good reason. Without maintaining this essential diversity, something you can find throughout nature, the world will become increasingly drab, standardised and monotonous and the only people left on the planet will inevitably form part of a coffee-coloured mush of uniform humanity. National-Anarchists wish to preserve the different races of the earth and believe that multi-racialism ends with the dissolution of all races. Racial separatism is the only way that the organic balance can be restored. We realise that it is impossible to separate people in the large cities and towns, many of whom have racially-mixed children or wish to live among foreign populations, and neither should we attempt to do so. Indeed, we believe that the nation-states of the West are likely to collapse in the next few decades and that our respective countries will begin to fragment along racial and cultural lines. So there is clearly no need to treat people inhumanely by herding them into camps or deporting them in the way that the Nazis and Soviets did in the last century; something which ended disastrously for those concerned. National-Anarchists must form new communities based on their own racial and cultural values. The maxim of the future will be respect for others and unity in diversity.